"Swords and Deviltry" by Fritz Leiber FIRST EDITION from 1970. Need I say more? Oh...how about gorgeous cover art by the legendary Jeff Jones? Oh, and "just one more thing" as Columbo used to say...the FIRST collection of the earliest FAFHRD AND THE GRAY MOUSER stories! This is one phenomenal paperback book, Poptoppers. This copy of this rarity is in VG-F condition, and is complete and intact with strong binding. 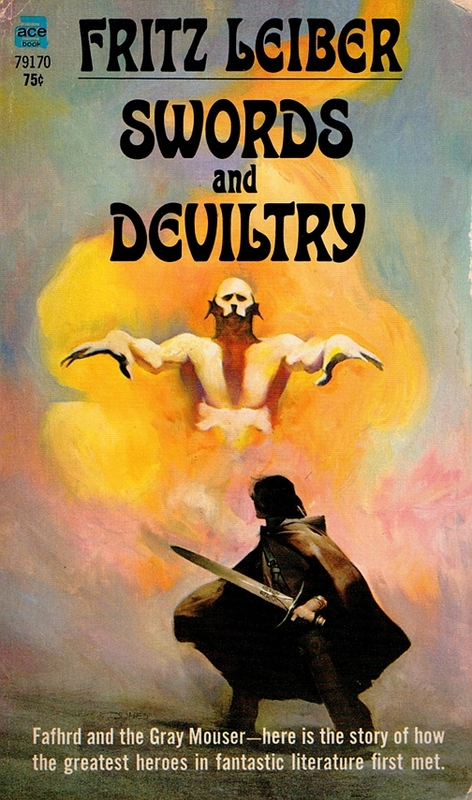 Wikipedia fleshes out the importance of this book: "Swords and Deviltry is a fantasy short story collection by Fritz Leiber featuring his sword and sorcery heroes Fafhrd and the Gray Mouser. It is chronologically the first volume in the complete seven volume edition of the collected stories devoted to the characters. The book was first published in paperback in 1970 by Ace Books. The book collects three short stories originally published in the magazines Fantastic for April 1970, Fantastic Stories of Imagination for October 1962, and The Magazine of Fantasy and Science Fiction for April 1970, together with an "Induction" that originally appeared in the 1957 Fafhrd and Gray Mouser collection Two Sought Adventure (later expanded, minus the induction, as Swords Against Death (1970). The Fafhrd and Gray Mouser stories follow the lives of two larcenous but likable rogues as they adventure across the fantasy world of Nehwon. The pieces in Swords and Deviltry introduce the duo and their relationship ("Induction"), present incidents from their early lives in which they meet their first lady-loves (Fafhrd in "The Snow Women", the Gray Mouser in "The Unholy Grail"), and relate how afterwards in the city of Lankhmar the two met and allied themselves with each other, and lost their first loves through their defiance of the local Thieves' Guild ("Ill Met in Lankhmar"). "Ill Met in Lankhmar" won the 1970 Nebula Award and the 1971 Hugo Award for best novella. "The Unholy Grail" was nominated for the 1963 Hugo Award for Short Fiction." Grab this scarce sci-fi-sword-and-sorcery classic before someone else does! Only one in stock.